Kyle Busch added to his XFINITY Series career victory total Saturday at Phoenix International Raceway and the race for the series championship tightened up just a bit. The victory for Busch was his 76th in the series. He led 190 of 200 laps. 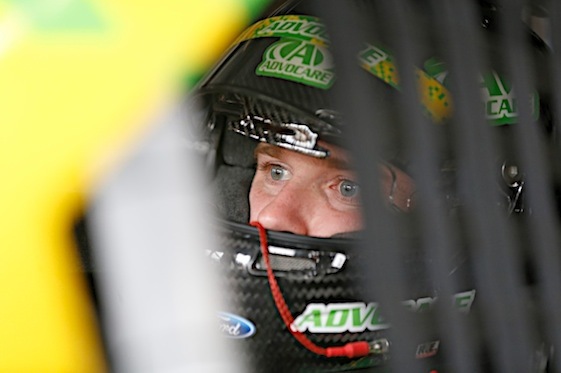 Points-leader Chris Buescher finished 13th. The two drivers closest to him in points – Chase Elliott and Ty Dillon – finished seventh and fifth respectively, however. Buescher will head to Homestead-Miami Speedway next weekend for the season finale with an 18-point lead over Elliott (down from 24) and a 22-point lead over Dillon. Fellows Cup regular Brad Keselowski finished second to Busch but over 3 seconds behind. He was asked what he needed to compete with Joe Gibbs Racing’s Busch. (1) Kyle Busch(i), Toyota, 200, $67011. (4) Brad Keselowski(i), Ford, 200, $43740. (3) Erik Jones(i), Toyota, 200, $43997. (5) Daniel Suarez #, Toyota, 200, $40608. (8) Ty Dillon, Chevrolet, 200, $35344. (11) Regan Smith, Chevrolet, 200, $32557. (12) Chase Elliott, Chevrolet, 200, $32297. (10) Darrell Wallace Jr. #, Ford, 200, $32312. (17) Elliott Sadler, Ford, 200, $29844. (16) Kasey Kahne(i), Chevrolet, 200, $24330. (13) Brian Scott, Chevrolet, 200, $29278. (6) Brendan Gaughan, Chevrolet, 199, $29127. (7) Chris Buescher, Ford, 199, $28950. (2) Austin Dillon(i), Chevrolet, 199, $24090. (9) Kyle Larson(i), Chevrolet, 199, $23103. (15) Ryan Sieg, Chevrolet, 199, $28592. (18) JJ Yeley, Toyota, 199, $28380. (19) Dakoda Armstrong, Ford, 197, $28219. (14) Ross Chastain #, Chevrolet, 197, $28308. (26) Blake Koch, Toyota, 196, $28497. (28) David Starr, Toyota, 196, $27885. (35) Harrison Rhodes #, Chevrolet, 195, $27770. (20) Ryan Reed, Ford, 194, $27634. (33) Anthony Kumpen, Chevrolet, 194, $27523. (32) Joey Gase, Chevrolet, 194, $27611. (34) Eric McClure, Toyota, 192, $27427. (31) Timmy Hill(i), Chevrolet, 191, $27391. (36) Mario Gosselin, Chevrolet, 191, $27320. (21) Landon Cassill, Chevrolet, Engine, 188, $27245. (22) Jeremy Clements, Chevrolet, 186, $27510. (39) Mike Harmon, Dodge, 184, $27154. (38) Korbin Forrister(i), Chevrolet, 174, $27119. (29) Ross Kenseth, Toyota, 149, $21079. (24) Dylan Kwasniewski, Chevrolet, Accident, 56, $27042. (23) Mike Bliss, Toyota, Suspension, 35, $26995. (37) TJ Bell(i), Toyota, Brakes, 19, $18791. (27) BJ McLeod(i), Chevrolet, Ignition, 19, $17791. (40) Ruben Pardo(i), Toyota, Engine, 15, $22791. (30) Carl Long, Dodge, Engine, 9, $15791. (25) Jeff Green, Toyota, Rear Gear, 3, $14791. Average Speed of Race Winner: 113.583 mph. Time of Race: 1 Hrs, 45 Mins, 39 Secs. Margin of Victory: 3.097 Seconds. Caution Flags: 3 for 18 laps. Lap Leaders: K. Busch(i) 1-63; E. Sadler 64-66; B. Keselowski(i) 67; K. Busch(i) 68-114; B. Keselowski(i) 115-120; K. Busch(i) 121-200. Leaders Summary (Driver, Times Lead, Laps Led): K. Busch(i) 3 times for 190 laps; B. Keselowski(i) 2 times for 7 laps; E. Sadler 1 time for 3 laps. Top 10 in Points: C. Buescher – 1,157; C. Elliott – 1,139; T. Dillon – 1,135; R. Smith – 1,133; E. Sadler – 1,044; D. Suarez # – 1,040; D. Wallace Jr. # – 1,037; B. Scott – 992; B. Gaughan – 991; R. Reed – 875.